REAR TINE TILLERS HAVE DUAL ROTATION TINES - 18" TILLING WIDTH - 4.5" TILLING DEPTH - ONE FORWARD/REVERSE SPEED - 16" TRACTOR STYLE TIRES. * Prices are subject to change. Tax, damage waiver, and other fees are not shown in above price estimate. 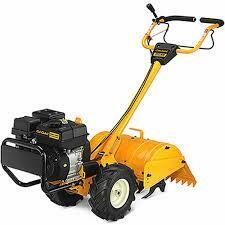 * Please call us with any questions about our tiller rear tine 6.5hp cub cadet rentals in South St. Paul MN metro area.